Chinese President Xi Jinping speaks during at a visit to Lincoln High School, Wednesday, Sept. 23, 2015, in Tacoma, Wash. Xi is on the second of a three-day trip to Seattle before traveling to Washington, D.C., for a White House state dinner on Friday. With his feel-good tours of Boeing, Microsoft and a local high school complete, Chinese President Xi Jinping departs Washington state Thursday for the other Washington, where tougher discussions on cybersecurity, intellectual property protections and human rights await. President Barack Obama's administration said this week that he won't paper over disagreements between the two countries on those topics, even as the leaders find ground where they can work together on other issues, including trade and climate change. Xi struck a gracious tone during his 48-hour stay in Seattle, during which he toured Boeing's plant in Everett, visited Microsoft's campus in Redmond, and received a football jersey with his name on it from high school students in Tacoma. In his public remarks, at a dinner banquet and at a meeting of top corporate leaders from both nations, Xi stressed the importance of U.S.-China business relations and vowed that his country would work to remove barriers to foreign investment and to improve intellectual property protections. He also expressed a willingness to work with the U.S. on cybersecurity — a priority for Washington. White House officials have said hacking attacks originating from China are approaching epidemic levels. The administration believes Chinese espionage was behind one of the worst U.S. government data breaches in history, the theft of fingerprint images of those applying for security clearances. On Wednesday, the Office of Personnel Management announced that an estimated 5.6 million images were stolen — not 1.1 million as first thought. "Problems are always outnumbered by solutions," Xi said Wednesday as he addressed the business leaders. He received an enthusiastic reception at Lincoln High School in Tacoma, where students gave him a football and a personalized jersey. "He said it'll fit him really well," said 17-year-old Mushawn Knowles, who presented the jersey to Xi. "And hopefully we can have influence on him to love football." Xi had presents of his own, giving the school books about his country, a ping pong table and balls, and inviting 100 students to be his guests in China. Xi is scheduled to arrive Thursday afternoon in Washington, D.C. He and Obama are scheduled to have a private dinner before Obama formally welcomes Xi and his wife at the White House for the official state visit Friday. Apple Chief Executive Tim Cook, Microsoft CEO Satya Nadella, Amazon's Jeff Bezos, investor Warren Buffett and Jack Ma of Chinese e-commerce giant Alibaba were among the 30 executives who attended Xi's Seattle address on Wednesday. The speech followed a closed-door discussion Wednesday moderated by former U.S. Treasury Secretary Henry Paulson, whose organization, the Paulson Institute, organized the gathering. Paulson noted the difficult issues and increasing tensions facing the nations as he welcomed Xi. But Paulson added: "The reason that the U.S. and China have a nearly $600 billion trading relationship, large amounts of U.S. investment in China, and increasing amounts of Chinese direct investment here, is because there are many areas where our national and business interests align." Xi agreed. Though he acknowledged hiccups as China shifts its economy from one driven by exports to one driven by a growing middle class, Xi told the group that China's economy will maintain a "steady medium and high speed of growth for a long time." 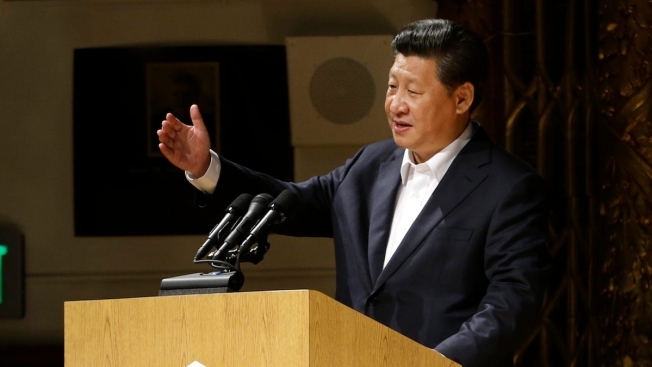 "China will open up still wider to the outside world," Xi said through an interpreter. "Without reform, there will be no driving force; without opening up, there will be no progress. ... There is good news, and I believe there will be more good news in the future." China will stand firm to protect intellectual property rights, he added. Xi attributed the Chinese economy's recent slowdown to three factors — world economic problems, proactive Chinese efforts at regulation and "protracted structural problems" in China. A big item of concern for the CEOs is a treaty that would provide a framework for broader investment in the economy of each nation. All of the American CEOs participating in the forum signed a letter to Xi and Obama urging them to support such a treaty, and they heard encouraging words from Xi on the topic Wednesday. "Once concluded, the treaty will further ease market access and put in place more open and transparent market rules," he said. An agreement with China could open up more of that nation's massive market to American companies, provide clearer rules for Chinese investment in the U.S., and create jobs in both countries, supporters say.